Oatmeal and McD's, that really doesn't roll off the tongue does it? Since I can remember, healthy and McDonald's went together like a shoulder check and Richmond. But more recently, we have seen things like salads, grilled chicken and other healthier alternatives at McD's. Are all of them good? Well, let's just say I personally prefer the fried and really artery-clogging versions more. C'mon! It's McD's... A supersized Filet-O-Fish meal please! However, the ad agency representing McDonald's Canada keeps sending me coupons to try their new items. 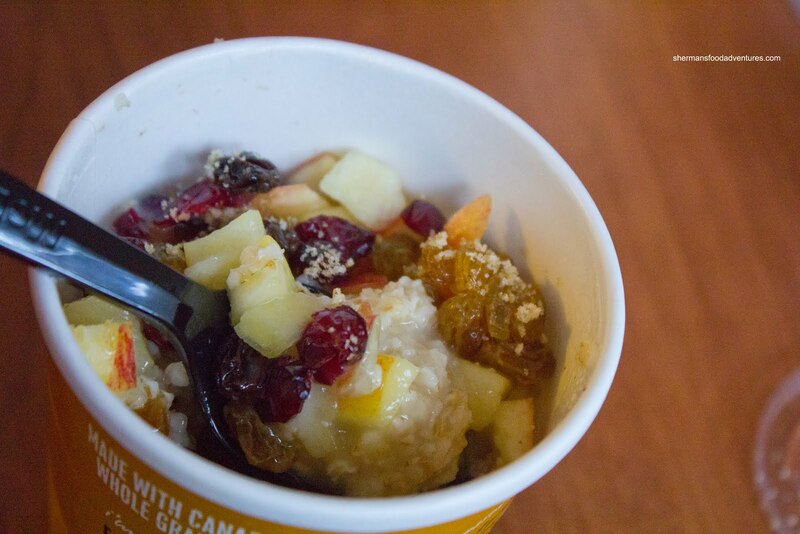 This time, it was their new Fruit and Maple Oatmeal featuring Quaker Oats. Long ago, I was into the instant Quaker Oats for Breaky because it was fast and somewhat healthy... until I took a look at the sugar content... Sure, there was "regular" without sugar, but that tasted like wallpaper paste (and I've tried that since some fell in my mouth whilst wallpapering... ewww...). 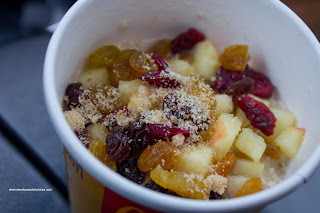 So I went in with no real high expectations since McD's uses the same instant oatmeal albeit with the addition of dried cranberries, golden raisins and apples. Viv and I agreed that the fruit was a real plus since it added real flavour to the plain oatmeal. We also liked that t he brown sugar was served on the side so we could adjust the level of sweetness. Hey, this oatmeal wasn't bad. I'd pay the $1.99 for it if I was at a McD's. However, you can't honestly believe that I was merely satisfied by a cup of oatmeal while there right??? 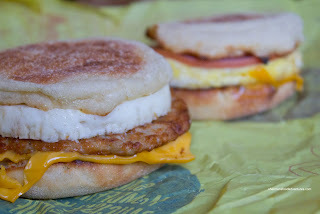 I picked up an Egg McMuffin and one with sausage as the main course too. LOL... For some reason, no matter how hard I try to make it at home, it doesn't quite taste like the original. 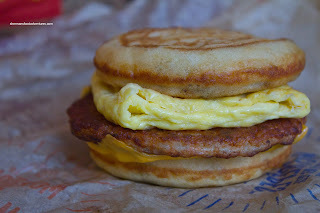 For the kiddies, I got them their favourite which is the McGriddle. For me, I'm indifferent because of the sweet pancake type bun. There are times I don't mind it and then sometimes I could do without the syrup bursts. My kids like sugar, so it works for them. Let me just throw this out there... The sausage patty at McD's is darn tasty despite the obvious fat content. I've never come across one at any supermarket that really compares. Better leave it that way I suppose. I do want to live. Okay, maybe I'll just stick to the oatmeal next time. Damn conscience! Are all of them good? Well, let's just say I personally prefer the fried and really artery-clogging versions more. Let's face it, when you go out to eat, who/why would you eat "healthy"?